Zola Jesus (aka Nika Roza Danilova) is releasing a new album, Okovi, on September 8 via Sacred Bones. Previously she shared its first single, the dramatic "Exhumed." Now here's another song from the album, the slightly more pop-y "Soak." A press release says the song "is written through the lens of a serial killer's victim, clinging to life and about to be dumped in the water." Listen below, followed by her upcoming tour dates. Danilova had this to say about the song in a press release: "I was thinking about this crucial moment inside the victim's mind, when she knows she's going to die. She thinks back at her life and the futility of the decisions she made, when, in the end her life would be cut short against her will. What's the point of trying to navigate life if you don't even get to choose how it ends? Instead of letting her fate be determined by someone else, she takes back control and turns it around, so instead, in her mind, she is choosing to die. She lets the killer assist her in suicide, as she gets tossed into the water and slowly drowns. Through writing this song the story evolved within me, and I saw how it mirrored my own feelings inside." Okovi marks her return to Sacred Bones after a stint on Mute. The album also features Danilova's longtime live bandmate Alex DeGroot, along with producer/musician WIFE, cellist/noise-maker Shannon Kennedy (from Pedestrian Deposit), and percussionist Ted Byrnes. Here's what Danilova had to say about the album in a previous press release: "Last year, I moved back to the woods in Wisconsin where I was raised. I built a little house just steps away from where my dilapidated childhood tree fort is slowly recombining into earth. Okovi was fed by this return to roots and several very personal traumas. "While writing Okovi, I endured people very close to me trying to die, and others trying desperately not to. Meanwhile, I was fighting through a haze so thick I wasn't sure I'd find my way to the other side. Death, in all of its masks, has been encircling everyone I love, and with it the questions of legacy, worth, and will. "Okovi is a Slavic word for shackles. We're all shackled to something--to life, to death, to bodies, to minds, to illness, to people, to birthright, to duty. Each of us born with a unique debt, and we have until we die to pay it back. Without this cost, what gives us the right to live? And moreover, what gives us the right to die? Are we really even free to choose? "This album is a deeply personal snapshot of loss, reconciliation, and a sympathy for the chains that keep us all grounded to the unforgiving laws of nature. To bring it to life, I decided to enlist the help of Alex DeGroot, who has been the only constant in my live band and helped mix the Stridulum EP back in 2010. It will be released on Sacred Bones, the closest group of people I'll ever have to blood-bound family." 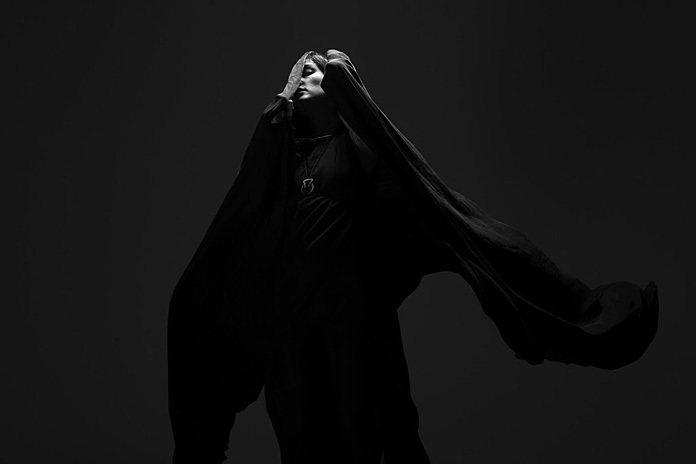 Also be sure to read our 2014 interview with Zola Jesus.